Trump Appears To Walk Back Syria Missile Threat - Joe.My.God. 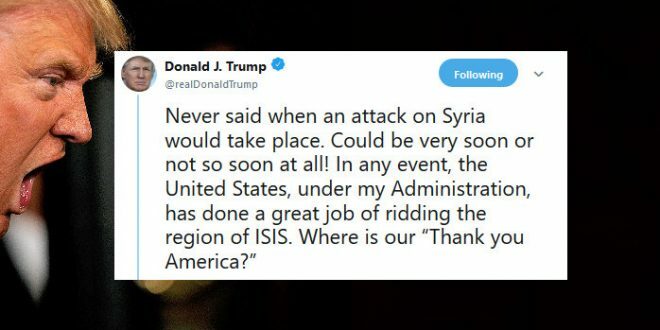 Donald Trump has backpedaled on earlier warlike statements about missile strikes in Syria – with a new Tweet where he says an attack may happen ‘not so soon at all’. His new statement may perplex allies, as it comes as British ministers consider the possibility of backing military action in the region. Theresa May is believed to be willing to take action against the regime of Bashar al-Assad without seeking the consent of parliament. Although al-Assad has denied the attack, Mrs May has previously claimed that ‘all the indications’ are pointing towards it being ordered by the Syrian regime.